Ferozsons Laboratories Limited in partnership with PanTheryx Inc. an innovative US life science company launched DiaResQ sachets, a breakthrough nutritional innovation for diarrhoea relief in children and adults. 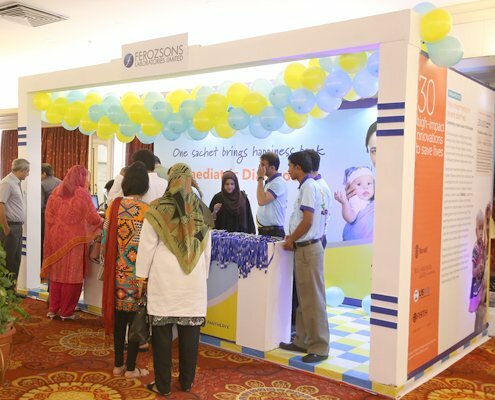 The product was launched during various seminars held across Pakistan in the presence of leading pediatricians. The product was included among the world’s 30 leading healthcare innovations that show promise in transforming global health by 2030, in the “Reimagining Global Health, Innovation Countdown 2030” report, produced by PATH, and supported by Bill & Melinda Gates Foundation, USAID and Ministry of Foreign Affairs, Norway.1 DiaResQ gives physicians an option for a highly effective nature-based treatment of diarrhoea, a disease that according to the Pakistan Demographic and Health Survey, claims around 53,000 lives of children under the age of 5 annually. DiaResQ supplements use of oral rehydration solution and zinc by providing nutrients for intestinal repair. Most children that suffer from diarrhoea in Pakistan are also reported to be malnourished. According to a study published by the British Medical Journal (BMJ), demonstrated the efficacy of DiaResQ in treating acute childhood diarrhoea caused by the most common pathogens. Ninety-six percent (96%) of the diarrhoea cases resolved with one dose of DiaResQ taken for three days – it significantly reduced fifty-six percent (56%) diarrhea episodes at day 1 of treatment as well.